Written by admin. Posted on February 1, 2010. Filed under North Atlantic Gyre, Sea Dragon. Tagged North Atlantic Gyre, Sea Dragon. Bookmark the Permalink. Post a Comment. Leave a Trackback URL. 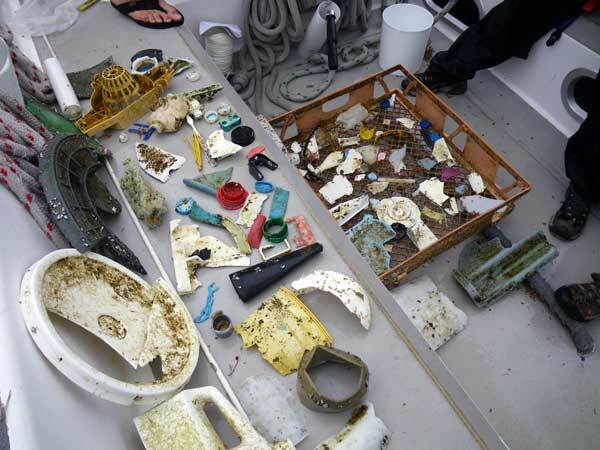 After days of waiting and lingering fear of finding nothing at all, we finally start to discover plastic. 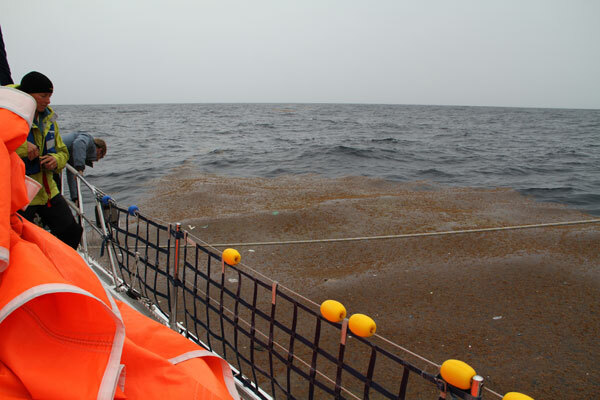 The closer we get to the center of the North Atlantic Gyre, big patches of sargassum come floating by. This seaweed with little airbubbles is part of a unique ecosystem. It thrives in a salty sea without surrounding land, the only one of it’s kind in the world. 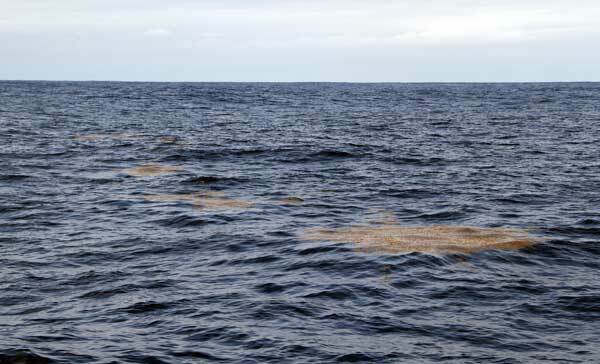 The Sargasso Sea is surrounded by the Atlantic Ocean and is collecting plastic debris due to the clockwise currents. Plastic flocks together with patches of sargassum which on their turn flock together in so called windrows, long lines of brown islands, floating on the water, hand in hand. Within an hour we collect a garbage bag full of debris ranging from lighters to bottle caps, toothbrushes, pieces of crates, lids, safelty helmets, ropes, nets and tubes. Anything you can imagine which is made of floating plastic can be found here. However, only 30% of all plastics is floating, the rest lays at the bottom of the ocean. Zo 7 feb: Zooo fijn om regelmatig foto’s en verslagjes te kunnen bekijken! Is de storm gearriveerd en goed doorstaan? Bracht die veel plastic mee naar omhoog, en zeezieken? Komen mijn netten van pas? Het moet moeilijk plasticvissen zijn met al die wieren, toch? Ook als ge d’r tussen zwemt. Goed dat ge altijd met 4-en zijt als ge de zeilboot verlaat. Komt ge wel eens andere schepen en (zeil)boten tegen? En de temperatuur is die zacht, zo’n 10° ‘s nachts, 15° overdag? Woe of do rij ik naar R’dam tot 18 feb.